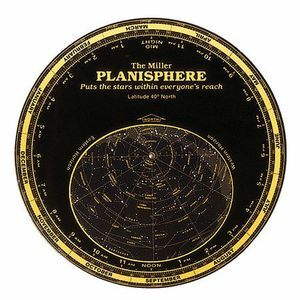 The Miller Planisphere - Most of the continental U.S. There are dozens of planispheres to choose from but this one is the classic. It has long been our most popular model. That's because this easy-to-use starfinder is a favorable choice for dialing up the night sky for any date and time. The durable plastic 10" wheel won't be affected by moisture and slips into a protective case when not in use. A great travel companion -- keep one handy in your car. Model 40 - 35-45 degrees latitude - most of the continental U.S.